Reunion Independence Course Hole 2: The best scoring opportunities on the front nine come early as there is a fairly easy par five (#1), a straightforward par three (#3) and this short par four. The hole has bunkers to avoid as usual, but generally is pretty wide and lacks the distance to require any long shots. Thus, the player can be aggressive and try to make a birdie with two decent shots. 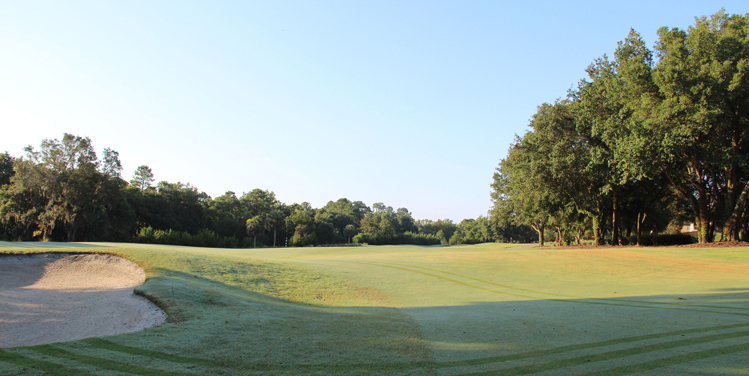 Reunion Independence Course Hole 4: This dogleg right has a very tough drive between large trees right and bunkers left. The drive must be hit far enough to get clear of the trees on the right to have any shot at the green. Thus, a lay up off the tee really isn't an option. The green is angled from front left to back right and is very deep with back pin placements being particularly nasty. Reunion Independence Course Hole 5: The second of long par fours, this one bends left and features a very tough second shot played between large trees. 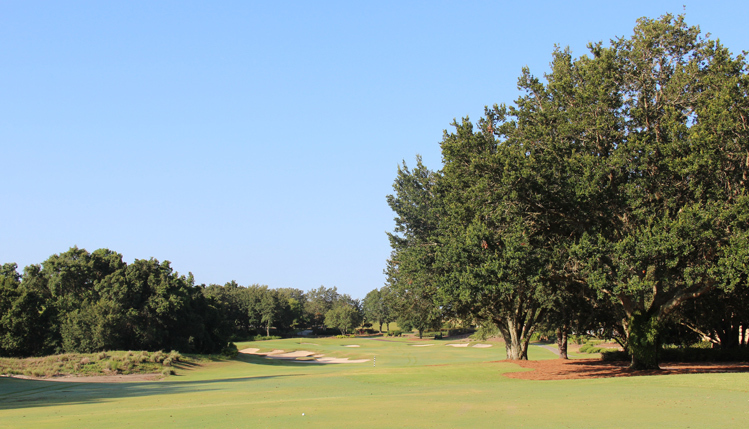 These trees have a tendency to grab shots and leave them short of the green, which falls away from the golfer for the back half. Reunion Independence Course Hole 6: Now that the driver is warm after the last two long par fours, Watson throws in a short one to tempt the big hitter to go for the green. 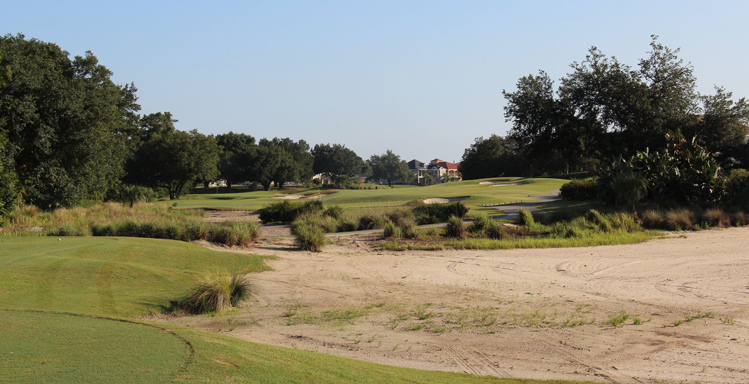 However, there is plenty of trouble left in the form of sand and trees, and there is OB right, so the more conservative approach is much more reasonable on this little dogleg left. Reunion Independence Course Hole 8: This par five has a drive that must avoid the trees to the right but the key shot is the second, which needs to stay right of the massive bunker to the left of the fairway that continues up to the putting surface, which is guarded by even more bunkers right. Reunion Independence Course Hole 11: One of the most picturesque holes on the course is this shorter par four that has an elevated tee. 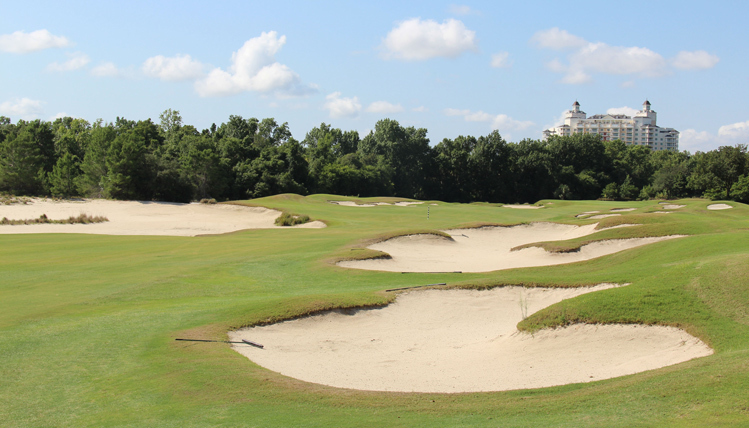 There is a huge waste bunker left that should be avoided and the hole is dotted with many other bunkers, all of which are plainly evident from the tee box. 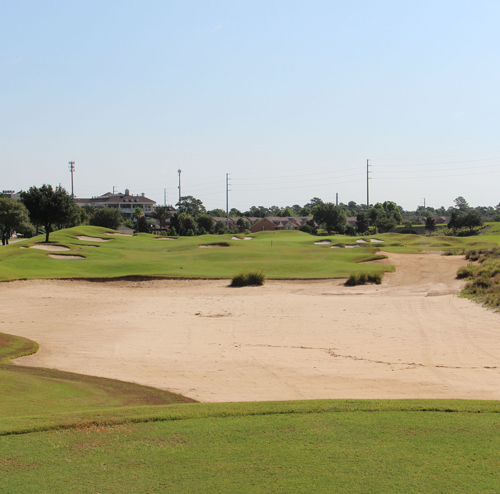 The green is small and well-guarded with an especially troublesome bunker to the left. Reunion Independence Course Hole 16 (left): This par four is straight and has a large waste bunker down the right for most of the hole and OB left. Pin placements back and right are very tough. Reunion Independence Course Hole 17 (below): The last par five of the day has OB running down the right side and is riddled with well placed sand traps and a massive waste bunker so the player needs to be on guard from tee to green.